Amazing taste and textural sensations will continue from your first to your last handful of this dark chocolate bridge mix. 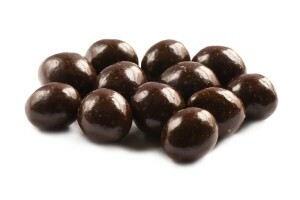 The pleasantly intense dark chocolate merges with the sweet raisins to create an ideally balanced flavor. A soft chewiness combines with the crunchiness of the almonds and peanuts. Then, as an unexpected surprise, a nostalgic malt flavor teases your tastebuds. Dark Chocolate (Sugar, Cocoa Butter, Chocolate Liquor,Vanilla, Salt, Soy Lecithin (An Emulsifier), Almonds, Raisins, Peanuts, Malt Ball Center (Corn Syrup, Sugar, Malted Milk Powder (Barley Malt, Wheat, Milk, Bicarbonate of Soda Salt), Whey, Vegetable Oils (Palm Kernel, Partially Hydrogenated Palm), Cocoa (Processed with Alkali), Skim Milk, (Natural and artificial Flavors, Soy Lecithin (An emulsifier),Confectioners Glaze. One bag contains about 120-140 pieces. The dark chocolate bridge mix is very high quality! I just hope you can keep it in stock! This is great. Good quality. Perfect mix of nuts under the thick coating.